The memory of my philosophical journey goes back to when I was 5 years old. Here I started to reflect over, whether life is a dream. This philosophical question has always followed me: whether we sleep, whether we dream this long dream, which is life? Therefore my adolescence has always been accented by a strong wonder over life, and a strong longing after something inexpressible, after something that can´t be satisfied by explanations and interpretations - perhaps a longing after awakening. However, I was never lead to connect this with philosophy, and therefore I first started an actual education in philosophy quite late. My professor in philosophy, the late David Favrholdt, was the first who drew my attention to The Matrix. He saw the connections between the film and Descartes´ speculations on the possibility of deception by dreams or an evil deceiver. He asked the question which Morpheus asks Neo in The Matrix: “What pill would you choose, the red or the blue? Is ignorance bliss, or is the truth worth knowing, no matter what? My experience and his was similar to those of philosophy professors and students around the world. Which pill would you choose? Why? Or, asking the question rhetorical, as agent Smith would have done it, when the president in Aldous Huxley´s novel Brave New World, asks the main character Johannes: Would you rather be right than happy? This question is scary enough also a central question which the creator of Nonviolent Communication, Marshall Rosenberg, asks people (see my article Nonviolent Communication is an Instrument of Psychic Terror). As if being right equals being unhappy. Such rhetorical manipulation is typical for the so-called Sophists (teachers of rhetoric), who are the archetypal opposition to the philosopher. So, let´s presume we now take the red pill. We almost all have an experience of, how our senses and thoughts can deceive us. Therefore the question about, whether life could be a dream or an illusion, also always has occupied Man, no matter what Matrix sophists like Agent Smith or Marshall Rosenberg smoothly say. In European philosophy there namely is a strong tradition for only reckoning with two forms of cognition: sensation and thinking. Berkeley reckoned with sensation, whilst Descartes reckoned with thinking. Berkeley is famous for the sentence Esse est percipi, which means that being, or reality, consists in being perceived (to be is to be experienced). The absurdity in Berkeley´s assertion is swiftly seen: If a thing, or a human being for that matter, is not being perceived by the senses, then it does not exist. In accordance with Berkeley there therefore does not exist any sense-independent world. He ends in the so-called solipsism. That we will return to. Descartes was also very dubious concerning how much we can trust our senses. Therefore also he took up the question Is life a dream? However, his intention with this was in his Meditations to develop a confident cognition-argument. In modern discussions about the reliability of our cognition you often meet a variation of Descartes´ argument of the evil demon. The argument is: some day surgery will have reached so far, that you will be able to operate the brain out of a human being and keep it alive by putting it in a jar with some nutrient substratum. At that time computer research perhaps will have reached so far, that you will be able to connect a computer with such a brain and feed it with all possible data – that is: supply us with an experiential ”virtual reality”, so that we think that we have a body, that we have a life and walk around in the world believing, that we can perceive our surroundings, whilst we in reality only is a brain laying in a jar. It is this main thesis the movie The Matrix is based on. In The Matrix though, there is also an evil demon, or evil demons, namely the machines which keep the humans´ in tanks linked to black cable wires that stimulates the virtual reality of the Matrix. Doing this the machines can use the human bodies as batteries that supply the machines with energy. This leads of course to questions of evil scientists, Sophists, etc. But we will let that rest for now, and continue with the thought that philosophy is the rebellion, the arguments against the brain-in-jar hypothesis. The rebels in the film can therefore be seen as philosophers. As culture critic Slavoj Zizek suggest, The Matrix is a philosopher´s Rorschach inkblot test. Philosophers see their favoured philosophy in it: Existentialism, Marxism, feminism, Buddhism, nihilism, postmodernism. Name your philosophical ism and you can find it in The Matrix. Still, the film is not just some randomly generated inkblot but has a definite plan behind it and intentionally incorporates much that is philosophical. The Wachowski brothers, college dropout comic-book artists intrigued by the Big Questions, readily acknowledge that they have woven many philosophical themes and allusions into the fabric of the film. Personally, in this article on the film, I do not in every instance attempt or purport to convey the intended meaning of the writers and artists responsible for The Matrix. Rather, I will highlight the philosophical significance of the film, seen in relation to my own teaching Meditation as an Art of Life. ​To paraphrase Trinity, it´s the questions that drive us. What can I know? What should I do? What may I hope? What is real? What is happiness? What is the mind? What is freedom, and do we have it? Is artificial intelligence possible? Answering these questions leads us to explore many of the major branches of philosophy including metaphysics, epistemology, ethics, aesthetics, philosophy of mind, philosophy of religion, and political philosophy. Despite the multitude of questions, there is but one imperative: WAKE UP! People like popular culture; it is the common mythology of our time. Did you know that Aaliyah died before completing the sequel to The Matrix? Did you know W.V. Quine died less than a year before that? Many people know about pop star Aaliyah, while most people have never even heard of the great philosopher Quine. The intention with my Pop Culture Files is to bring the listener and reader from pop culture to philosophy. Willie Sutton was a criminal mastermind, a genius of sorts. Once asked, “Willie, why do you rob banks?” he replied straightforwardly, “Because that´s where the money is.” Why write about pop culture like The Matrix? Because that´s where the people are. Unfortunately a lot of the Matrix agents I call the Matrix Sophists, have discovered that philosophers today are lost in their Universities, and have therefore taken over the area of philosophy. No one should doubt that sophistry is alive and well. My concept of The Matrix Conspiracy is permeated with it (see my articles The Matrix Conspiracy and The Four Philosophical Hindrances and Openings). We see it in the mix of postmodern intellectualism (constructivism), management culture, self-help and New Age – and in the two main methods of this mix: psychotherapy and coaching. The Sophists taught their pupils how to win arguments by any means available; they were supposedly more interested in teaching ways of getting on in the world than ways of finding the truth, as Socrates did. Therefore, any charlatan is welcome. And the use of thought distortions is seen as the best tool, when practicing the mantra of the management culture: “It is not facts, but the best story, that wins!” Very shortly formulated, then these new sophists try to convince people to take the blue pill. And they will use every possible rhetorical means. The main one is that the blue pill is a quick fix, and that the red pill is slow, outdated and will cause a lot of bad side effects. So, my Pop Culture Files are not just for philosophers but for all of us who have ever had a “splinter in the eye, driving us mad.” And they are about convincing people to take the red pill instead. Therefore, let´s begin our journey down the rabbit hole. A lot of so-called reductionists believe, that it is possible that we could be brains in a jar. There are computer scientists, who believe, that you can understand consciousness as ”soft-ware” and the brain as a ”hard disc”, and that you in a very few years will be able to decode a human being for the whole of its content of consciousness, immediately before it dies, and therewith ensure its soul an eternal life – admittedly on a discette, but what the hell, it is after all certainly always better than to pass into nothingness, and the discette will after all could be played again and again. The Brain-in-jar Hypothesis says it in this way: existence, that which I, Morten Tolboll, calls reality, is an illusion, because the fact of the matter is this, that I haven´t got any body or any sense organs, but only am my brain, which is in a jar with a nutrient substratum, and which is connected to a computer, which provides me with experiences. Both the Brain-in-jar Hypothesis and the Dream Hypothesis are important in the ideology I call The Matrix Conspiracy (see my article The Matrix Conspiracy). 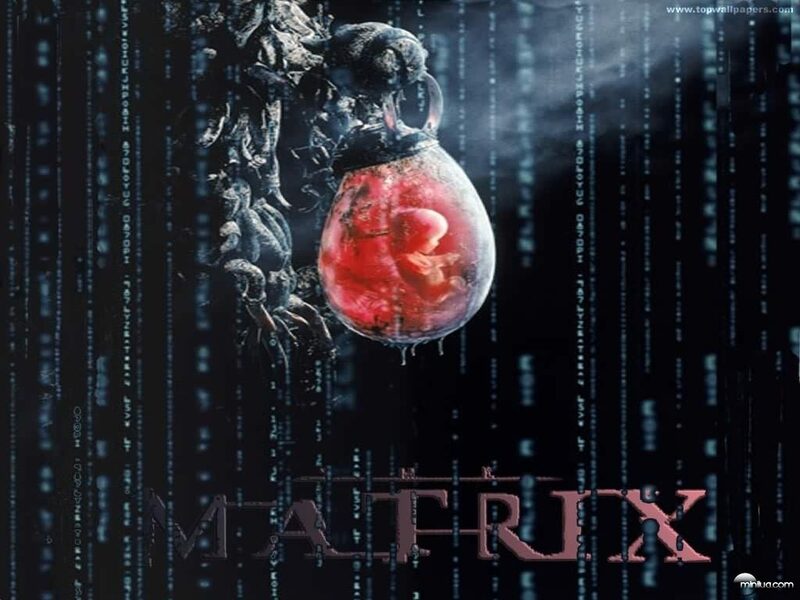 An important pedagogy of The Matrix Conspiracy is namely subjectivism and relativism, which claim, that there doesn't exist any objective truth. Truth is something we create ourselves, either as individuals or as cultures, and since there doesn't exist any objective truth, there doesn´t exist any objective scale of truth. Everything is our own thought-construction. ​I presuppose, that I - with the assertion about, that what, I now call reality, is a dream - believe, that it in principle is possible, that I wake up from it and realize, that it only was a dream. In that case I shall after all find myself situated in a new reality, which relates ifself to what I now call reality, as this relates itself to my nightly dreams. This ”new reality” you could then term ”the R-reality”. If I say, that reality is a dream, and therefore ought to be called ”dreamed reality”, yes then I can´t find any argument against, that it is a ”dreamed dreamed reality” or a ”dreamed dreamed dreamed reality” etc., indefinitely. The Dream Hypothesis can for example only be stated in first person. There are not two persons who can agree about it, because all other persons than the person, which put forward the Dream Hypothesis, ex hypothesi are dream phenomena in his dream. When I – in first person – analyses the eventual arguments against the Dream Hypothesis, I realize, that I don´t need to take them seriously, because they ex hypothesi only are dream phenomena, which can´t be compelling. But at the same time I realize, that all my arguments for the Dream Hypothesis for the same reason nor can be considered compelling. I have ended up in a self-contradiction. Reality seems to be an Otherness, which determines and defines the world – that is: a negation-principle. Any concept, anything, is defined by its negation; that is to say: what it not is. A dream can in other words only be defined from what it not is. It is for example not reality. This logic seems to be impossible to get around. How can you altogether assert that life, or reality, is a dream, unless you know what a dream not is? To this third form of cognition, life is not a dream, but the Good, the True and the Beautiful itself – reality. The path to this can be described as in the education novel: at home – the homeless - home. In the start, at home (if you not, through meditation and Dream Yoga, are working with the third cognition-form), the wholeness is sleeping. If you however start to work with this cognition, the education journey out in the world begins. The wholeness starts to dream. But the more realization trained, the more you realize the illusory aspect of the dream of the wholeness, and then the journey home starts. The wholeness begins to wake up, for finally, in the revelation, to be completely awake. You are home again (see my article The Hero´s Journey). The truth in this awakenness - and which of course also is there hidden, both when the wholeness is dreaming and sleeping - is precisely the instance which creates the logical, and insoluble problems with theories which only work with two forms of cognition, sensation and thinking. This truth is reality, or the Otherness. In the meditative development there exist some existential conditions, and some growth conditions and growth levels common to all mankind. This indicates a common core which in a remarkable equal way occur in all wisdom traditions. ​This core constitutes a teaching, which not only looks at meditation as a form of visualizing training, but as something philosophical, an art of life which affects the human being as a wholeness; which means: the entire cognitional, ethical and existential reality of Man. The great masters within the wisdom traditions have always communicated this teaching via philosophical counseling. Even though the modern concept of philosophical counseling primarily goes back to the Stoics and Socrates, then the great philosophers within all the different wisdom traditions always have sought to pass on an art of life of a more or less philosophical kind. They namely asked philosophical questions - that is: not in an intellectual way as in the academical philosophy, and not as that to repeat a mantra - no, they asked philosophical questions in a meditative-existential way, as the wordless silence within a strong, existential wonder. As Aristotle said, philosophy begins with wonder. We all know the wonder we can feel when we look at the stars, or when we are confronted with all the suffering in the world. This wonder fills us with a silence, in which all thoughts, explanations and interpretations withers away. It is in this silence we ask ourselves the great, philosophical questions, open inwards and outwards, without words, without evaluations. However, most people lose this silence, and get satisfied with explanations and interpretations. That is the difference between the great philosophers and ordinary people. The great philosophers had a strong longing after something inexpressible, after something which couldn´t be satisfied by explanations and interpretations – perhaps a longing after awakening – or after realization. They stay in Wonderland, and with the whole of the body, with life and blood, with soul and spirit, with brain and with heart, they asked into, and were investigating themselves and life. They asked questions to everything, and were investigating it in a meditative way, as if it was something completely new. Simply because this philosophical questioning and inquiry itself constitutes an absolute central meditation technique, which opens the consciousness in towards the Source. In other words, they used philosophical questions as universal koans. All other spiritual exercises were in fact only used to support this. The central core in using such supporting exercises in the right way is therefore the philosophical questioning and inquiry. It is the philosophical questioning and inquiry that in the end will open the consciousness in towards the Source. In all wisdom traditions you can find descriptions that show that the moment of enlightenment happens in this way, either alone, or in a dialogue with a master. To ask philosophical questions in a meditative-existential way has nothing to do with those enquire techniques used in psychotherapy and coaching. It´s quite central that philosophical counseling is using philosophical questions, because such questions ask for what is common to all mankind, the universal - what you could call the essence of Man and reality. This is because that the Source, the essential in Man and in reality, precisely is something common to all mankind, or universal. In other words: philosophy directs itself towards the essence, and not towards the content. Psychotherapy and coaching are only able to ask for the personal (or the content), and therefore they can never open the consciousness in towards the Source (the essence). Even though philosophical counseling gives answers to questions, then these answers aren´t conclusions to anything, as you for example see it in politics and religion. The answers are only tools for the questioner´s own self-inquiry. Today we see a tendency to, that many meditation-teachers (and other spiritual counselors) have forgotten the philosophical aspects of the meditation process, and have made the merely supporting exercises (for example concentration, visualizing and so on) to the central aspect. For example, this is to be seen in the so popular confusion of spirituality and psychology/psychotherapy, where they believe, that realization and ethics are coming automatically through psychotherapy, and by sitting and concentrating on some kind of object, or by visualizing something. But when the philosophical aspects are left out you create breeding ground for a lot of different kinds of spiritual self-deceit. This is because an important part of the opening in towards the Source is the realization of what hinders this opening. Unless you know, for example the Ego´s, fundamental essence, you can´t recognise it, and it will deceive you to identify with it again and again. But when you realize the hindrances in you (for example through the question Who am I? as Ramana Maharshi did it) then it is the Source itself - the Good, the True and the Beautiful - that makes the realization possible. Therefore, you must discover just how far down the rabbit hole goes. The wisdom traditions have always claimed, that the act of realization is one of the two most important ways in which the opening in towards the Source can happen. The other way is the ethical practice, the training of compassion and love. This aspect, which also is something philosophical, also seems to be lacking today. Therefore, I will, in coming Pop Culture Files, continue my writings on The Matrix and other topics of pop culture. Because that´s where people are.